I have been using many EFT techniques on my clients for the past few years and it has produced incredible results in helping them to reduce and eliminate their pain. Sometimes I use EFT in combination with a massage and other times I just use it on it's own. The mini- version that I've listed here, might give you a taste of what is possible with EFT. This routine will allow you to target the symptoms which can give you some temporary relief. To target the actual cause of the pain so that it provides relieve long term, you will need much more training and skills. Please visit my website for more information and to view a few videos about EFT - Emotional Freedom Techniques. This technique will often reduce and even eliminate pain in a few short minutes. It basically uses the same Energy Meridians used in acupuncture. But instead of using needles we stimulate these energy points by tapping on them with our fingers. Below is a chart with a few of these tapping points. - While focusing on the pain , tap on the points shown in the chart. Use the tips of your fingers to do the tapping. - when you've finished tapping on all the points, take a few deep breaths and see if the pain has gone down. If there is still some pain remaining, then do another round of tapping. ( Remember to focus on the Pain while tapping ) Take a couple of deep breaths, and see if it is all gone or if you need to do another round. - I like to use both hands to tap on both sides simultaneously. - Sometimes the pain may temporarily intensify after a round of tapping. This just means that your body has tuned in to the cause of the pain. Do not get scared, just continue to do a few more rounds of tapping and it should begin to dissipate and disappear. - Another, very interesting thing that sometimes happens with this technique is that the pain, will move from one location to another. For example, you do a round of tapping for a pain on your lower back, and the pain moves to your Left Shoulder. So you do a round of tapping while focusing on the Pain in your Left Shoulder, and then the pain moves back to the lower back or to another part of the body. If this happens, do not worry, just keep tapping on the new locations. In EFT, we call this "Chasing the Pain". If you just continue to chase the pain by tapping on it where ever it is located, it will normally diminish or disappear. You can use this same technique when you feel anxious, angry, stressed, sad, crying, having a panic attack, .... it normally lessens the intensity of what you are feeling at the moment. Just tap while tuning in to your emotion. This is just a mini & quick version of one of the numerous techniques comprising EFT ( Emotional Freedom Techniques). 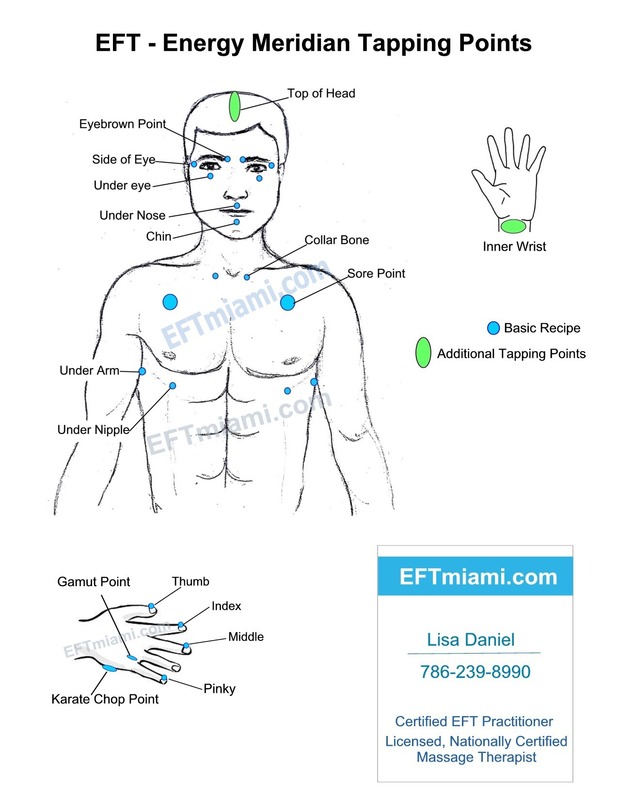 If you want to learn more, please visit my website www.eftmiami.com or call me to schedule a private EFT Session. Private Group Sessions & Training are also available: Just call me if you are interested in getting a group of friends or coworkers together, at your home or office.